At the bottom of Anchor & Hope Lane, you will find the last lighterage company on the upper reaches of the Thames. 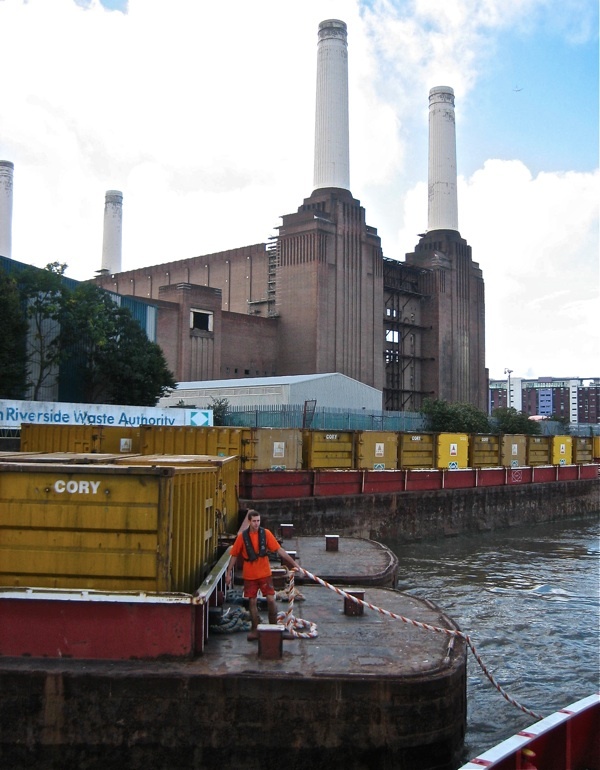 Begun in 1896 as William Cory & Sons, delivering coal to London and filling the empty barges with rubbish for the return journey, today Cory Environmental is a vast corporate endeavour, compacting the capital’s waste, transporting it downriver by barge and incinerating it at Belvedere in Kent. These “rough goods,” as the lightermen term them, are now the only commercial cargo transported on the Thames, once the primary thoroughfare of our city. Yet in spite of all the changes on the river, the task of the lighterman has remained essentially unchanged for centuries. 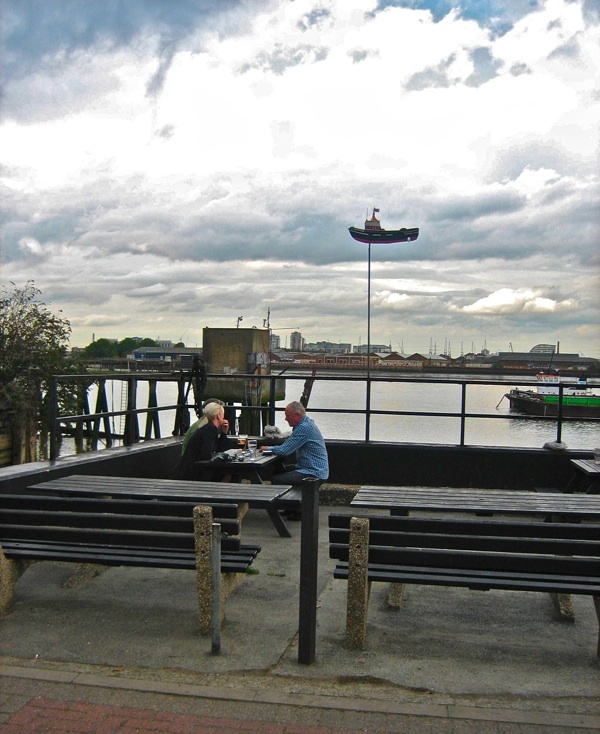 Originally, each barge or “lighter” was rowed or punted by one lighterman with a boy to assist, lightening the cargo of merchant ships delivering to the Port of London. 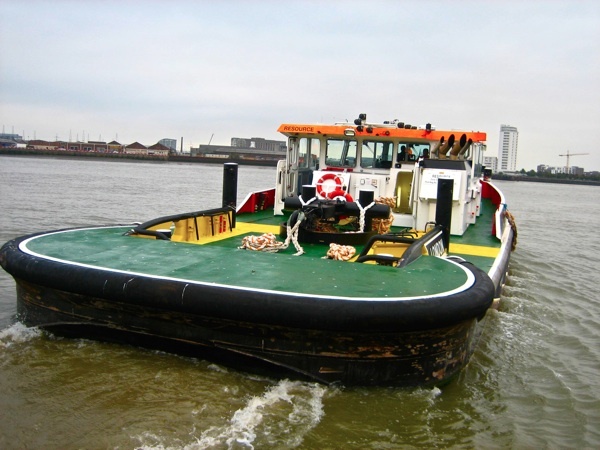 In the nineteenth century, the introduction of steam powered tug boats allowed the lighters to be towed in multiples, but the equation of one-lighterman-one-lighter persisted. 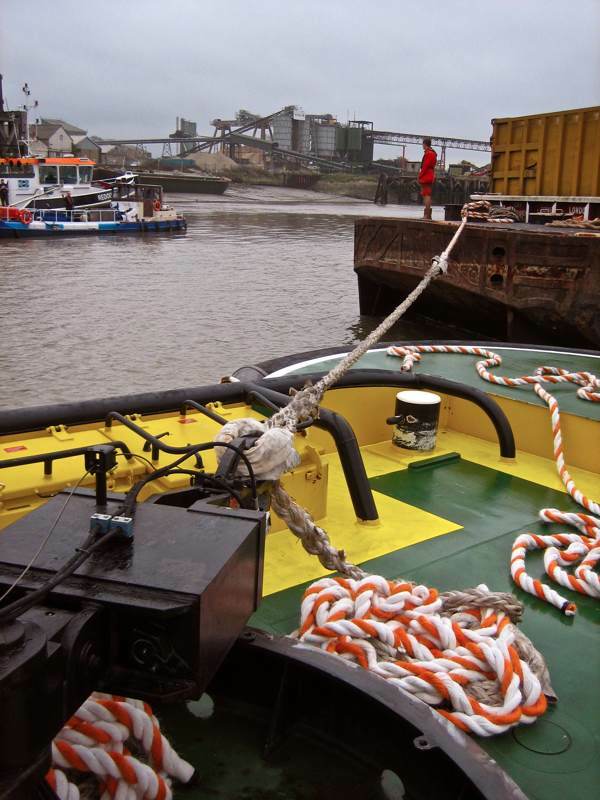 And when I joined John Dwan – skipper of the tugboat Recovery – for a day, his crew consisted of mate, engineer and two lightermen to go aboard the barges, manoeuvring and leashing them as required. 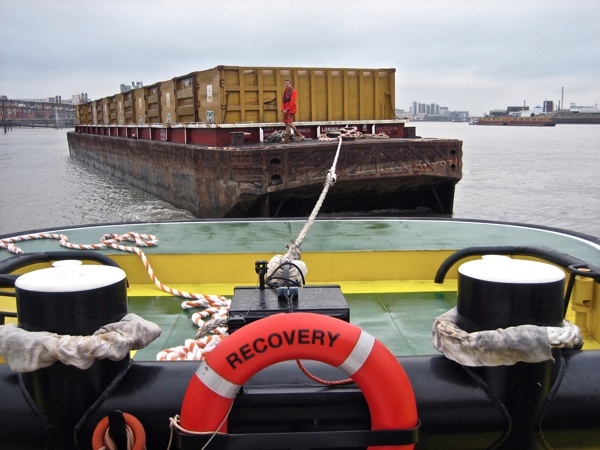 We set out upriver from Charlton Pier under an overcast sky, with barges of empty containers in tow for delivery to the depots at Walbrook in the City of London, Cringle in Battersea and Wangas in Wandsworth. “It’s a contact sport! You don’t put your hands in your pockets – that’s the first thing you learn,” John declared with relish when the sturdily-built tug lurched and rolled as the barges were shunted around prior to departure, bouncing off the rubber enforced sides of the boat and clanging together with a boom which resonated like thunder. 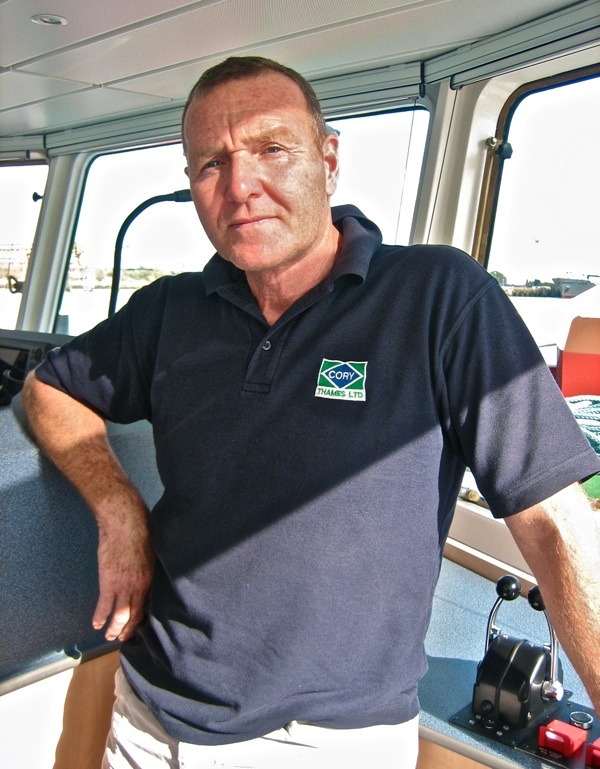 Starting on the river at age fifteen, becoming a skipper at twenty-one, John has held licences as both waterman & lighterman since 1972, like his father Albert, and grandfathers Gosso Williams and Charlie Dwan before him. 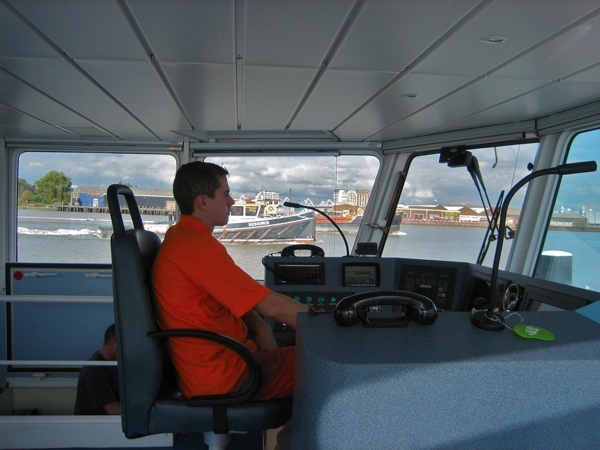 And going back as far as he knows – for at least four generations – all the men in John’s family worked afloat. 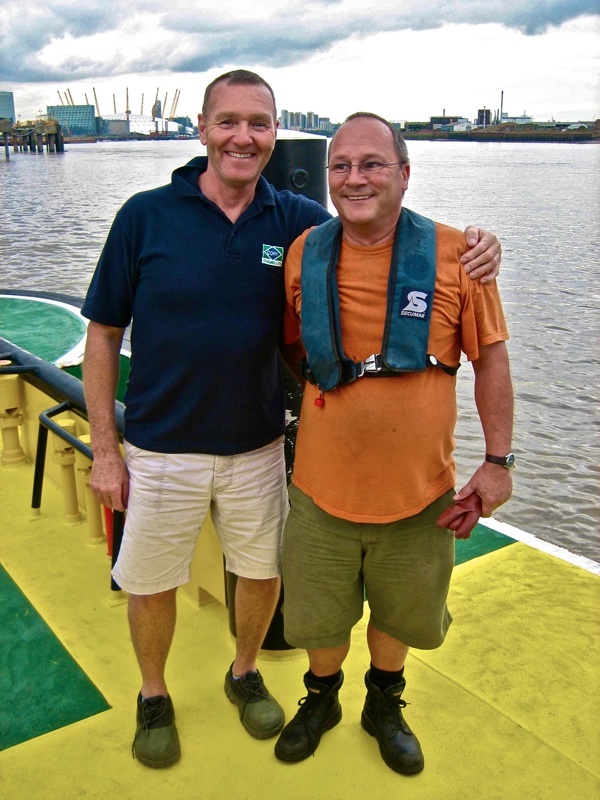 “Most of the people you speak to on the Thames will have ancestors who worked on the river.” he promised me. 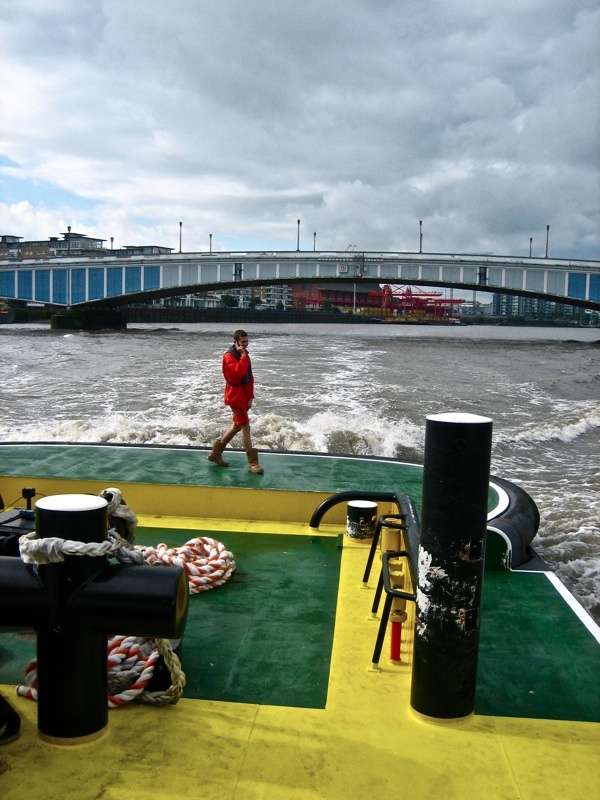 Once we reached central London, the clouds parted and – apart from occasional passenger boats – we had the expanse of sparkling water to ourselves. 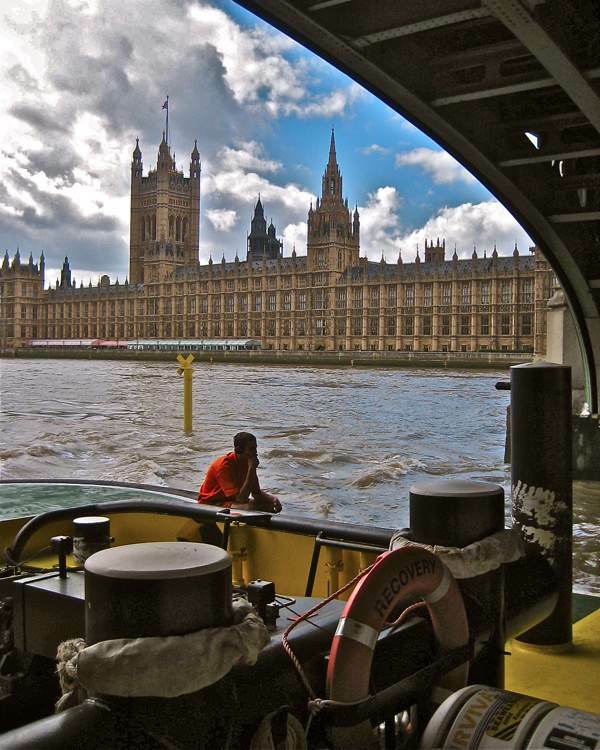 Coming under Hungerford Bridge in the small tugboat just above water level, the Wheel loomed over us on the left while Big Ben and the houses of Parliament rose up to the right, seemingly to create a theatrical spectacle for our sole enjoyment, at the centre of the river. “It’s the best way to see London,” said John in understatement, thinking out loud for my benefit. Thus a pattern was set for the day – of leisurely discourse and wondering at the ever-changing spectacle of the river, punctuated by bouts of intense activity, shunting the barges at each depot. 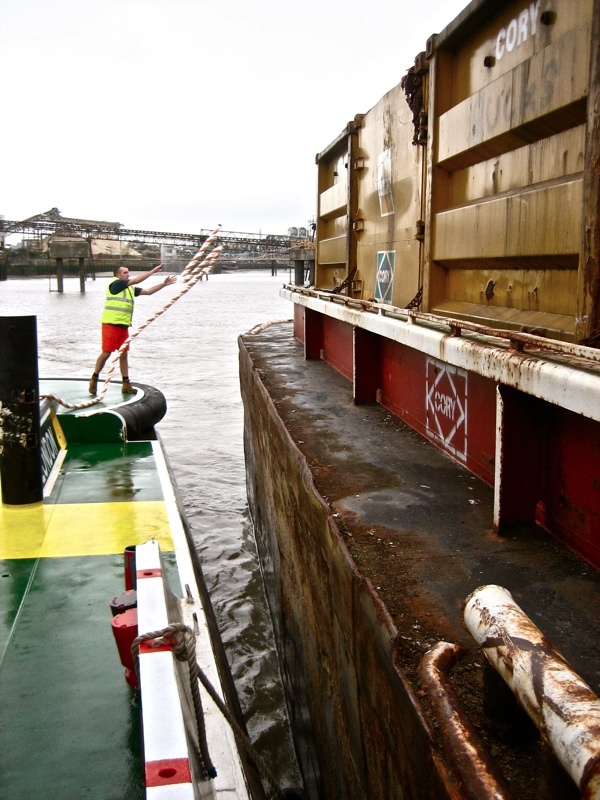 Every barge has tethering posts at either end and on each side, permitting them to be shifted in any direction by a tug boat. Yet such manoeuvres were rarely straightforward, with plenty of work for the lightermen, walking up and down perilously narrow ledges along the sides of the barges with ropes – attaching and reattaching them to different corners of the barge so the tug could pull the vessels in different directions and thereby achieve the desired position. 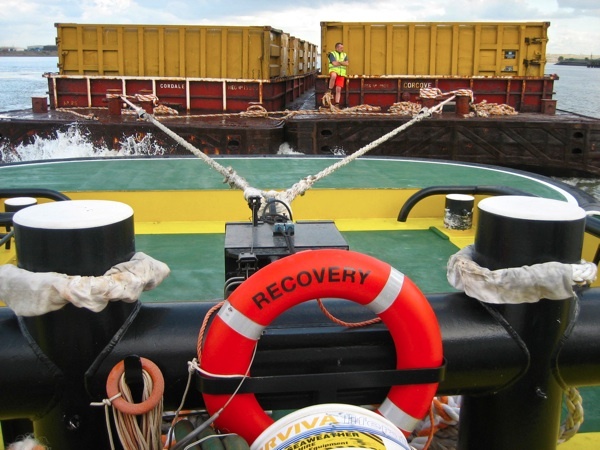 Dexterity in handling boats is a prerequisite in this job and these men have been doing it their whole lives, coaxing five hundred ton barges to travel in exactly the right direction. London’s Victorian bridges were built for the fifty ton barges of their day which gives John Dwan little margin for error when towing several of his vessels through at once. Although he makes it appear effortless, it was apparent that the consequences of an error would be disastrous. 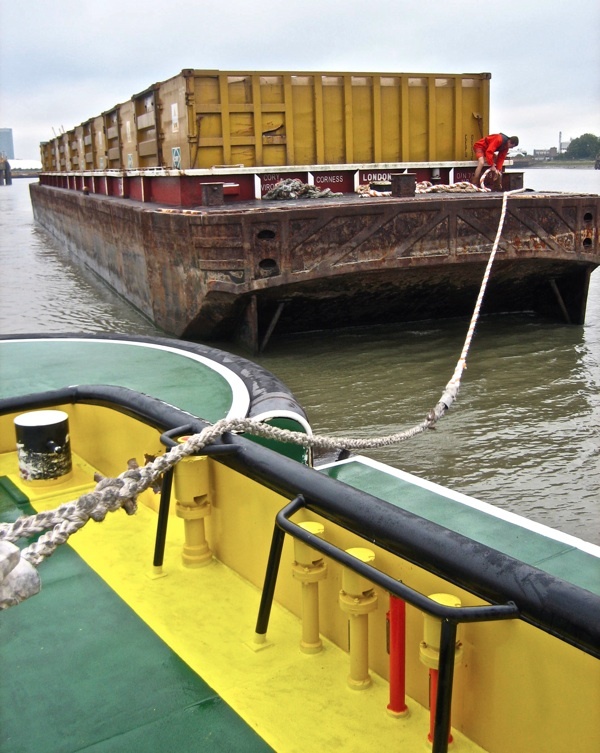 “The industry hasn’t changed, the barges just got bigger!” he quipped. 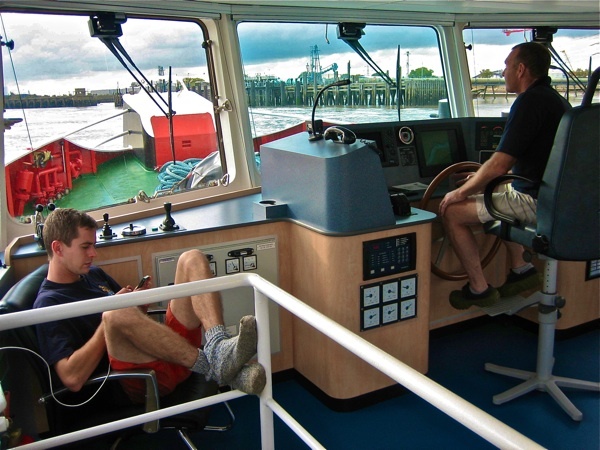 “We’re river men and we don’t want to go to sea.” John Dwan informed me, speaking for his crew, outlining how the lighterman gets to enjoy life afloat and go home to his family at the end of the day. ”The only difference between us and a lorry driver is the road don’t change.” he proposed unconvincingly. 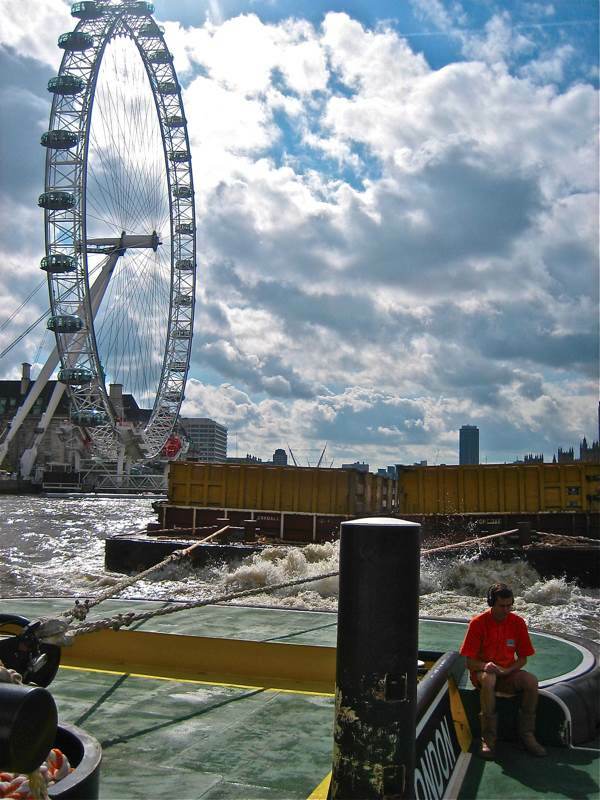 As we returned down the Thames with full containers, I looked up at the city workers crossing bridges. We were within metres yet they did not see me, because we were in separate worlds – and I understood how the life of a lightermen encourages a propensity for independent thought, observing life from the water. We passed Charlton, where we set out, and travelled on through the afternoon to the vast complex at Belvedere in Kent, where red cranes like giant spiders lifted the containers from the barges. Even six months ago, London’s waste had been creating landfill at Mucking but now, after incineration, the metal can be recycled and the ashes are used to manufacture breeze blocks, which can return to rebuild the city. After so many generations, the lightermen feel the loss of all the wharves which once lined the Port of London, leaving nowhere to unload even if someone wanted to return to river transport for freight. 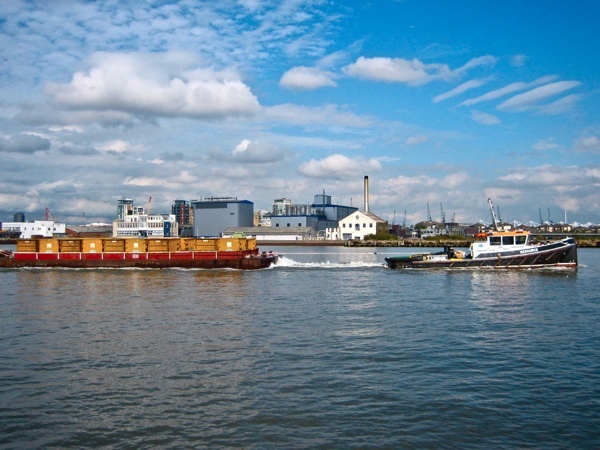 River transport should be the ideal way to take lorries off the road and transport commodities into London, but the removal of the infrastructure makes such a move impossible, at present. “We’re sliding into history,” John Hughes told me, shaking his head as we sailed in the lone vessel down the empty river where once was the busiest dock in the world. Yet the lightermen are still here for the foreseeable future, and keeping their hands in, lest the tide should change in their favour. John Dwan & John Hughes – both watermen & lightermen – they were at school together and worked on the Thames over forty years. 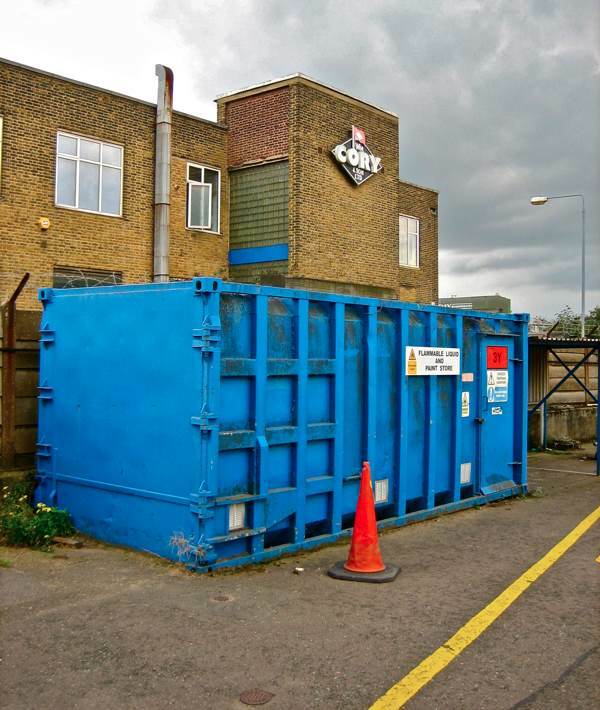 William Cory & Sons now known as Cory Environmental, London’s last lighterage company. 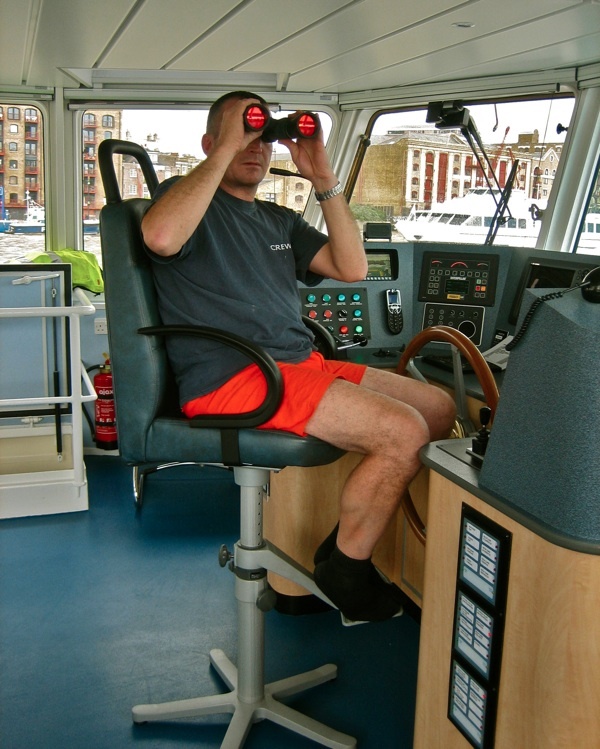 Bobby Prentice, Waterman & Lighterman. I just love the gritty real life imagery and stories on Spitalfields Life! Oddly, the morning after I read this I noticed a new development along the bank of the Seine in the heart of the 7e arrondissement (I live in Paris). While the river is home to a fair amount of commercial shipping, it is mostly building materials (sand, rock, cement) and rubble. 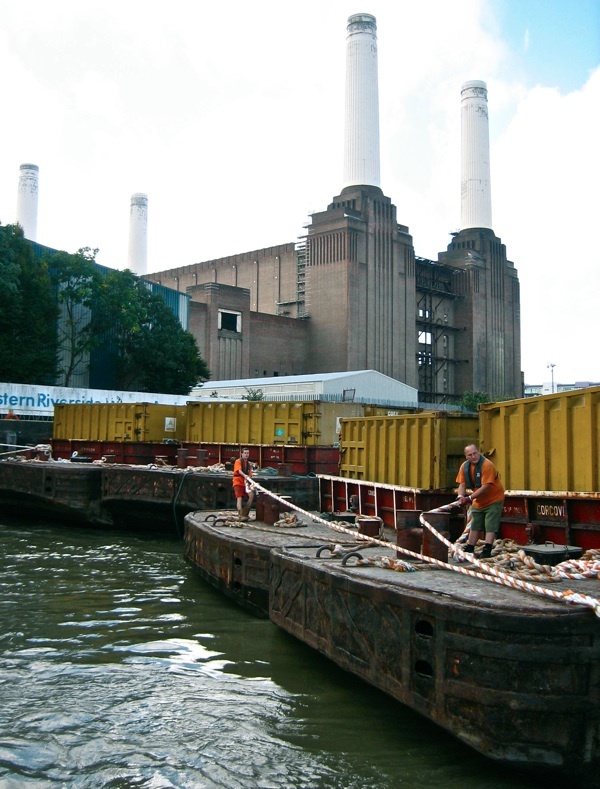 One of the paper shredding/recycling companies also use barges. The supermarket chain Franprix has recently opened a small container handling facility just upstream from the Pont de l’Alma. Before dawn, containers are transferred from a barge to waiting lorries to distribute the stocks to the shops around town. From the containers visible, I would estimate that it saves at least 20 lorry journeys into and out of Paris every day. Surprisingly, the site is small. A concrete pad no more than 100m long by 20m deep. Essentially a small car park with a very large forklift-ish plant in it. I can imagine there are similar sites available along the Thames in London. If only a business had the imagination to make a business case to use them.